We visited the village of Yandabo, known as the site of the 1826 Treaty of Yandabo that began the long British occupation. The treaty ended the longest and most expensive war in British Indian history. Fifteen thousand European and Indian soldiers died, along with an unknown, but almost certainly higher number of Burmese. At the time it cost the British five million pounds or more than twenty billion in todays dollars. The treaty required Burma to give up parts of India and Bangladesh that they had previously occupied. The village has about 250 homes and families and about 1,200 residents. Today the village is famous for its pottery and we had the opportunity to watch some of the local artisans at work. The pottery is made from clay gathered along the rivers banks. 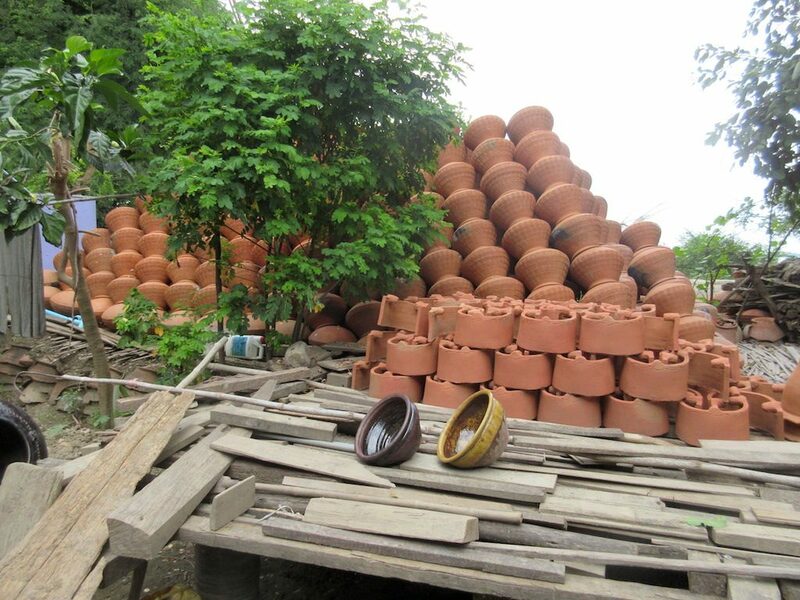 They use the pottery to store water and food supplies. Mostly women are the potters and it is a two-woman job with one person potting while the other operates the wheel using a treadle. The women decorate the pots with patterns before arranging them in a circular pattern to dry. There may be up to three thousand pots in a mound of wood and straw which is then covered with a large pile of ash, straw and wood before being set on fire. The temperatures reach 2,200 degrees for three to four days including the cooling. 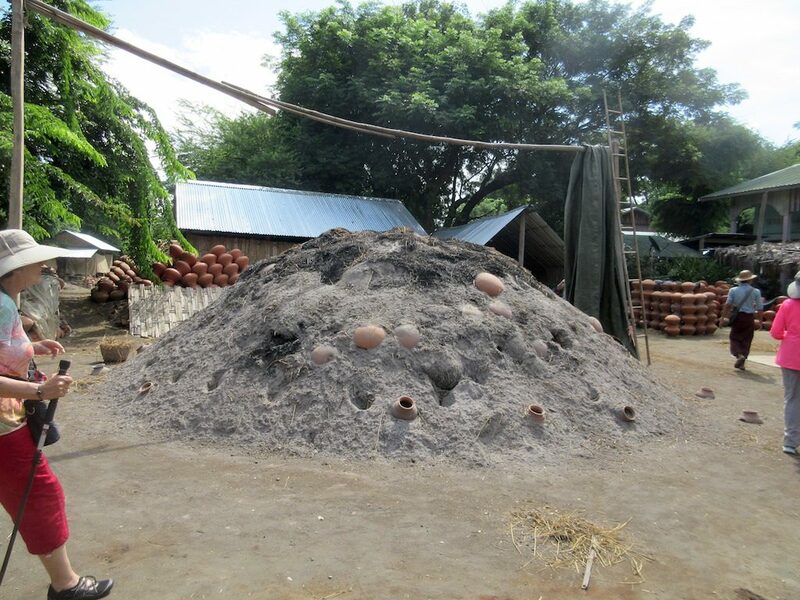 At the end of the process the pots change in color from a dull brown to a brilliant red clay color. The finished product is then transported for sale all over the country by trucks and boats. We visited a local elementary school with about 120 students in kindergarten through fourth grade. It was a holiday because of the full moon, but the village children came to the school to greet us and to sing a couple of songs for us. They were very cute. We also gave them the school supplies we brought for them. The village is quite primitive with very basic wooden homes, some with palm frond roofs or in some cases corrugated steel. The homes are mostly built on two levels with the ground floor serving as the main living area and the upstairs being a sleeping area and a place for storage and to get out of the water in the rainy season. The floors are dirt and are sparsely furnished with a table and chairs, mats for sleeping on or beds with mats, and usually no electricity unless they have a solar panel and battery connection for a few lights. They have outhouses and no running water. 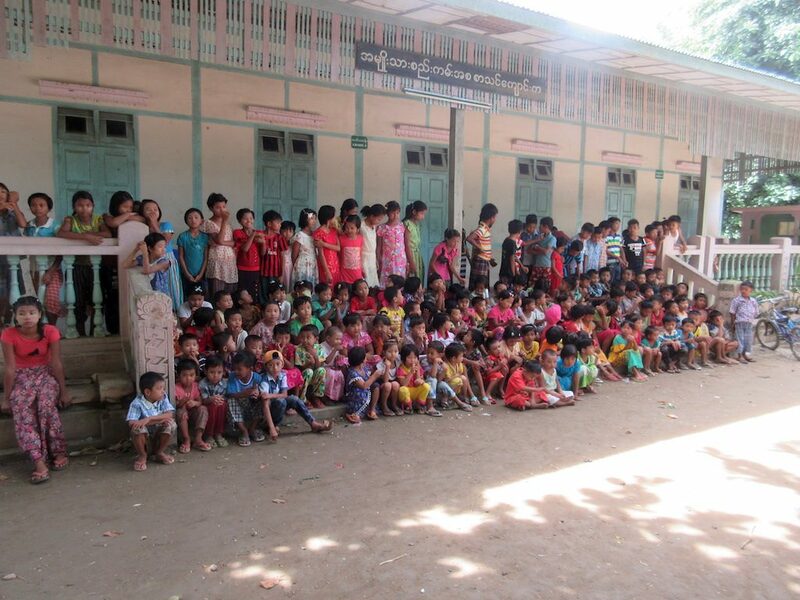 The school was a bit better built with a raised foundation, a floor, wooden walls with shutters and a metal roof. There are no windows to speak of and there are very limited lights (maybe two fluorescent tubes in a room) operated by solar panels. After lunch onboard we visited the small village of Hnaw Kone. There we took a walking tour to get a glimpse of the local’s daily life along the river. 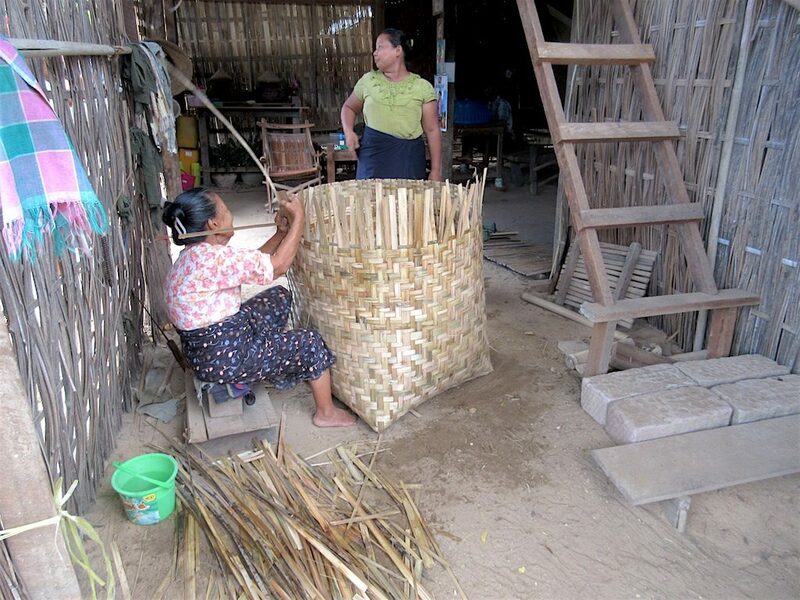 This village of about 1,000 residents and 200 homes is known for the woven baskets made from bamboo canes. They large baskets are about 36” tall and wide and they use the baskets to store rice, tobacco, beans and other goods. The women in one family can make about 10 of these baskets in one day and they sell them for about $1.50 each. They also weave thin strands of bamboo into panels for building homes. The bamboo does not grow in this area but it comes from the far north of Myanmar and is transported south by floating bundles of it on the river. The bamboo is then cut into sections about two-inches wide and soaked for a few days in water until it is moist. 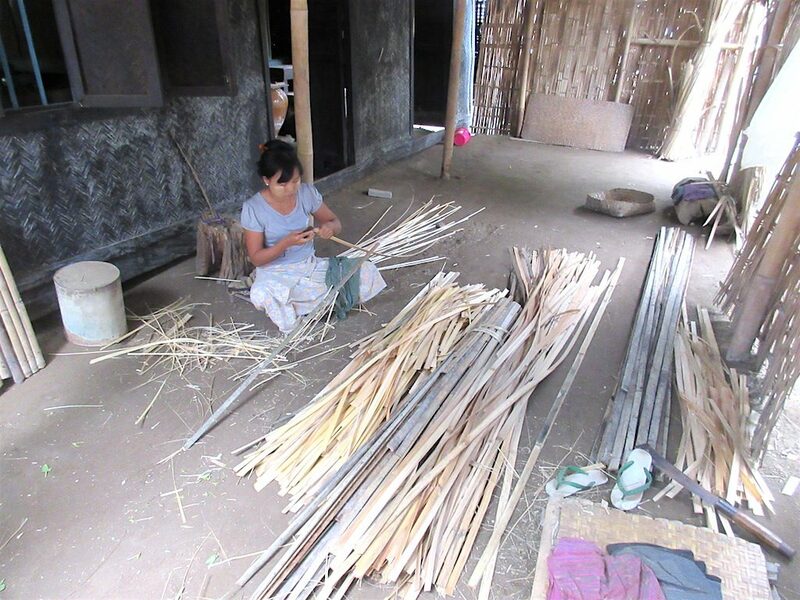 Once soft, the thickness of the bamboo can be split into very thin strips which are then used to weave baskets or even used for thatched roofs. This village appeared slightly more affluent than the village we had visited in the morning. Many of the homes were larger and appeared better built. There had more livestock and chickens. They are also mostly farmers who grow tobacco nearby and only make baskets as a second income for the family. In this village we visited another elementary school that has students from kindergarten to the ninth grade. They sang us the national anthem and another song and we gave them some school supplies, balls and badminton rackets. 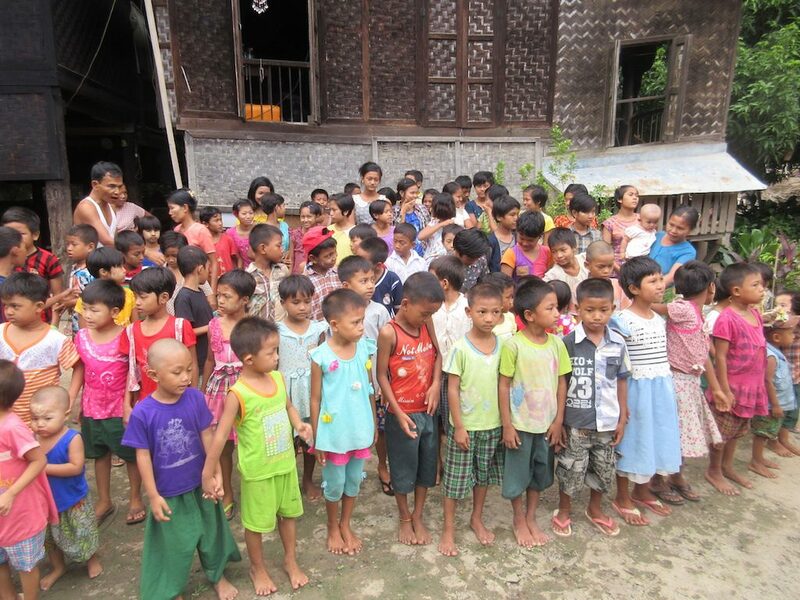 Only about 30% of Myanmar’s population has access to the power grid. Upon returning to the ship, we attended a lecture by the program manager, Robin, about life along the Irrawaddy River. He shared photos and info about many aspects of life along the river. In the evening we were treated to a Burmese puppet show, a long tradition kept alive by talented artists. Believed to have started about 1780, the Burmese marionette puppets employ 18 or more strings for a human character and each puppet is controlled by only one puppeteer. A Burmese marionette troupe has 27 different characters including a buffoon, princes and animals of all types. The puppets are typically accompanied by a musical group and each puppeteer uses his own voice for each character. This particular performance used taped music.